Two weeks ago the inseparable duo behind popular game-themed web comic Penny Arcade received an award for their work as "video game ambassadors", this weekend they'll be earning it... again. Friday marks the kick off of the team's East Coast expo in Boston, an extension of the popular, often overflowing Penny Arcade Expo held each year in Seattle. Penny Arcade creators Jerry Holkins and Mike Krahulik liken this latest endeavor, a second convention, to having a second child. "We're still not 100 percent sure we can do both," illustrator Krahulik tells me, half kidding, I think. "A third one would be reaching too far," writer Holkins says. "A third one would be dangerous," Krahulik adds. "A third one would ruin us," Holkins says. "We say that now," Krahulik says. They tend to conduct interviews that way: Finishing each other's thoughts, turning a question into a discussion between the two, often laced with humor and self-deprecation. It's not surprising given everything they have accomplished together. 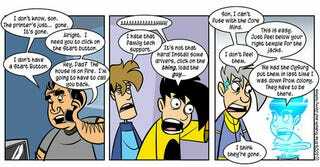 Popular webcomic Penny Arcade debuted in 1998, written by Holkins and illustrated by Krahulik. What started as a online comic strip updated three times a week on their website eventually lead to an industry under the guiding hand of business manager Robert Khoo. Penny Arcade now runs an international charity that has raised more than $6 million for sick children, an annual expo that last year filled Washington State's Seattle convention center with more than 60,000 people, their own video game and a series of popular books. Last March, Holkins and Krahulik were honored by the Washington State Senate for their work with fundraiser Child's Play. I caught up with the two earlier this month, just moments before they were ushered into the bowels of San Francisco's Moscone Convention center to receive their latest honorific: A Game Developer Choice Ambassador Award for their help in making the game industry "a better place." The first thing the two did when they found out they were receiving the awards, Krahulik tells me, was look it up on the Internet. They wanted to make sure, they say, that it wasn't an elaborate trap for the industry to deliver a beat down on the two who have so often held game developers and publishers to higher standards through sharp wit and sometimes cutting comics. Krahulik is quick to point out that they're only mean to the industry because they love video games so much. The way Holkins figures it, they were selected because so many of their comics point out the good in gamers and games. "It's not hard to promote a true thing," he said. About an hour after our interview, the two took to the stage of the Game Developers Choice Awards, delivering a humorous off-the-cuff acceptance speech of sorts before heading out to the airport to go their separate ways: Krahulik back home to celebrate his anniversary with his wife and Holkins to get to work on Penny Arcade Expo East, due to kick off this Friday. The inaugural East Coast event, which sold out last Friday, features three days of talks (including one by Kotaku), panels, concerts, movies and gaming. It also has a show floor packed with the latest offerings from the likes of Microsoft, Nintendo and oodles of other game developers. And Holkins and Krahulik won't be heading home when the show wraps up. Instead the two will be kicking off the East Coast leg of their latest book tour, this one promoting The Splendid Magic of Penny Arcade: The 11 1/2 Anniversary Edition. Book tours, web comics, charities, video games, expos, the two have a grueling schedule that seems to get more packed with each year, not less. They both also have children. I asked them if they think the comic has changed now that they have children. "The comic is about our lives," Krahulik says without hesitation, "as our lives change the comics will. Our readership has been growing with us." Are either of them concerned, I ask, that they could become less relevant to gamers as they grow older. Could they become the stereotypical parents, people easily confused by new and previously unimagined technology? Essentially, could they become like their own parents? "I don't think there is enough demographic data on aging geeks," Holkins says first joking, and then turning serious. "Growing up our dads didn't play, they went to work. But now as dad's we do play. "The reality is, I think you're describing a person who no longer exists." Well Played is a weekly news and opinion column about the big stories of the week in the gaming industry and its bigger impact on things to come. Feel free to join in the discussion.